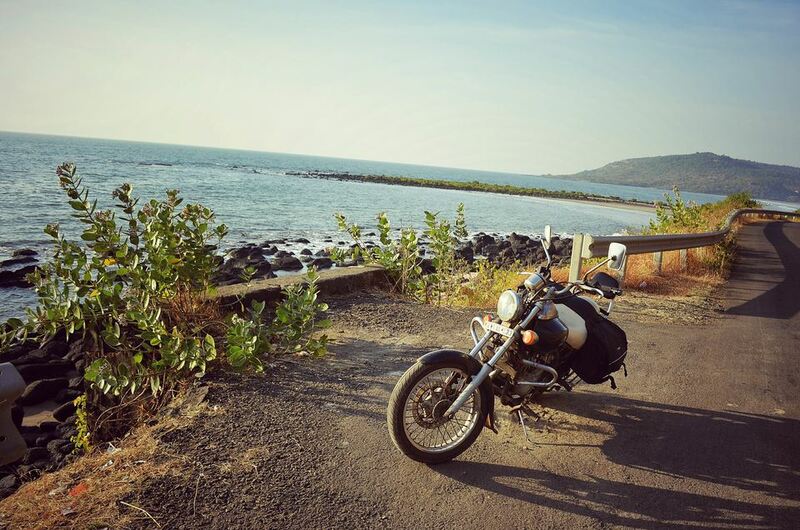 Mumbai to Tarkarli beach, in southern Maharashtra, by motorcycle via State Highway 4 (SH4) is an epic road trip with unforgettable scenery. It's definitely all about the journey, not the destination! Although SH4 is called a highway, in reality it's nothing more than a country road. On numerous occasions, it runs into the water and a ferry must be taken to cross to the other side. SH4 is referred to as the coastal route, due to its proximity to the ocean. It provides some dramatic backdrops of surf and sand from atop steep cliffs, where it hugs the coast. However, the road also runs inland for a significant part of the way, across surprisingly barren hills, and through pleasant villages. The condition of the road is extremely variable. Some parts of it are pitted with twists and turns, and pot holes. Others are straight and well-sealed. To avoid taking a wrong turn and getting lost, a GPS is invaluable as signs are frequently absent. Due to the fact that the going is slow along the SH4, many people prefer to take the faster National Highway 17 (NH17) or National Highway 4 (NH4) from Mumbai to Tarkarli. Hence, SH4 is notably devoid of traffic. From time to time, you may encounter bullock carts, cows, pedestrians carrying water or bundles of sticks on their heads, and the odd auto rickshaw or local bus -- as well as other motorbikes. It's a peaceful, pollution-free ride. As is the case in many parts of rural India, the locals are helpful, genuine people, who don't stare or harass. Don't expect English to be widely spoken though. In addition, signs are often in the state language, Marathi. This trip is off the tourist trail. Most visitors are Maharashtrians who come from Mumbai or Pune. The distance from Mumbai to Tarkarli via the coastal route is approximately 500 kilometers (310 miles). Riding about 150 kilometers (95 miles) a day at a steady pace will take five to six hours, depending on how often you stop. There are many possible detours to beaches and temples along the way, so do allow plenty of time. I undertook the motorcycle road trip in January 2015 with my husband on his Bajaj Avenger. It was a fabulous, albeit sometimes tiring, adventure -- and we both loved it! In my opinion, January and February are the perfect months to go on the trip as it's off-season for Indian tourists, and the weather is warm and sunny (not hot). The following pages outline the route we traveled and where we stayed. Mumbai Ferry Wharf -- ferry to Rewas Jetty -- Alibaug -- Revdanda -- Kashid -- Murud -- Murud-Janjira. This route follows the Alibaug-Revdanda and Revdanda-Murud roads. About 100 kilometers (62 miles). The ferry takes approximately and hour and a half from Mumbai to Rewas. Travel time from the jetty at Rewas to Murud-Janjira is close to two hours. The lesser known ferry service at Ferry Wharf is different to the one that operates from the Gateway of India in Colaba. It's located at the dockyards at Mazgaon, and carries motorcycles as well as people (no cars though). Ferries depart frequently, around every 30 minutes starting from 6.30 a.m., and the cost was 150 rupees for a motorcycle. Strict security has been implemented at the ferry terminal. Motorcycle riders have to complete paperwork and show their driver's license at the police checkpoint at the entry. Unfortunately, we left home a lot later than anticipated and ended up catching the 1 p.m. ferry. Staff manually loaded the bike onto the upper deck of the boat via a wooden plank. It was a spacious and clean boat, with capacity of more than 100 people. Yet, there were no more than 20 passengers. Fresh vada pav was sold on-board and old Bollywood songs played over the speakers. What more could you want for an enjoyable trip? Owing to our lateness, we decided to not to travel all the way to Murud-Janjira as planned. Instead, we stopped at Nagaon beach, south of Alibaug, for the night. It's likened to mini Goa during the busy season but since it was off-season for Indian tourists, it was deserted. We left Nagaon beach early the next morning, at 8.30 a.m., to try and make up the travel time that we'd lost the previous day by not riding all the way to Murud. After emerging from the thicket of coconut palms, the road begins hugging the sea a few kilometers before Kashid beach. This long, wide beach is lined with casuarina trees, snack stalls, and hammocks. The coastal road continues to provide captivating ocean views all the way to Rajapuri, including a magnificent elevated outlook across to Janjira Fort. We stayed at Dolphin House Beach Resort, just a couple of minutes walk behind Nagaon beach, and were the only guests. Unfortunately, the restaurant was also closed. The Golden Swan Beach Resort is the best hotel in Murud-Janjira. If you're traveling on a budget, try The Nest Bamboo House cottages, offering simple beach huts surrounded by coconut trees on Murud beach. Murud -- Rajpuri -- Agardanda -- Mandad -- Pabhare -- Mhasala -- Srivardhan -- Harihareshwar -- Bagamandla -- ferry to Bankot from Bagamandla -- Kelashi -- Anjarle -- Harnai. Rajapuri and Agardanda both have ports and it's possible to take ferries across to the other side from there, which cuts down on distance traveled. It's convenient if you don't have to wait long for a ferry. The listed departures of the Rajapuri ferry are as follows: 7 a.m., 8 a.m., 9 a.m., 9.45 a.m., 10.30 a.m., 11.30 a.m., 12.30 p.m., 1.30 p.m., 2.30 p.m., 3.15 p.m., 4.15 p.m, 4.45 p.m., 5.15 p.m., 6 p.m. The Rajapuri ferry goes to Dighi and is a small pedestrian ferry that also carries motorcycles. From there the road will take you down to picturesque Diveagar beach, followed by Shrivadhan. The newer and bigger Agardanda ferry, which commenced operating in 2014, goes further inland to Rohini and also takes cars. It usually departs every hour on the hour. At Bagamandla, ferries to Bankot also depart every hour on the hour from 6 a.m. These ferries take cars as well and you can ride your motorcycle straight on-board. About 120 kilometers (75 miles). After stopping for breakfast, we arrived at Rajapuri just before 11 a.m., only to find out that there wouldn't be another ferry until 12.30 p.m. due to lack of demand. Frustrating! As we didn't want to wait for so long, we decided to take the road inland through Mandad via SH98 and SH99 from Mhasala to Shrivardhan. (If you can get the ferry, it's worth it though, as the the road to Diveagar beach offers some spectacular sea views). I felt daunted. We had such a long way to go. And, who knows what obstacles we would face. Would we get there before nightfall? Srivardhan beach, where we had lunch, was an impressive surprise. The foreshore has been thoughtfully developed, complete with promenade, benches, rubbish bins, and public toilets. I'd never seen anything like it in India before. Options for eating were limited, however. We ended up settling for a small Chinese restaurant, where the food was unexpectedly good. A short distance further south, before Bagamandla jetty, Harihareshwar is another picturesque beach with interesting rock formations. The town is famous for its Shiva temple housing an ancient Shiva linga. There's a pradakshina route around the temple, along the sea shore. The real sea views start from Padale beach, before Anjarle (take the Anjarle-Aade road, not SH4 here), where the road runs excitingly close to the coast all the way to Harnai. Anjarle is best known for its Ganesh temple, which sits on the cliff, while Harnai has a fort and huge evening fish market. After an extensive day of riding along winding roads and dodging pot holes, we made it to Harnai late in the afternoon just before the sun started setting. It was a relief to be able to finally stretch our legs but our bums were so sore we could hardly walk! We were exhausted. We chose to stay the night at Murud-Karde beach (not to be confused with Murud-Janjira near Alibaug), south of Harnai, at Naad Beach Resort. The resort is a large ancestral property, situated right on the beach, with a coconut and spice plantation at the rear. There are 12 basic cottages with hot water in the mornings (no showers, bucket baths only). We paid 1,800 rupees per night for a couple, including breakfast. I was thrilled to discover that the mattress was soft and delicious Konkani cuisine was served. One of my objectives on the trip was to eat as much fish as possible -- fish thali daily for lunch and dinner! Again, being mid-week during the off-season, we were the only guests and the beach was refreshingly quiet (that is, apart from a group of guys doing wheelies on the beach in their four wheel drive vehicle while blasting music, which seems to be an annoyingly popular activity there). Harnai -- Dapoli -- Ladghar -- Burondi -- Panchanadi (can take a detour to Kolthare beach before here) -- Dhabol -- ferry from Dhabol to Dhopave -- Anjanwel -- Guhagar -- Velneshwar -- Hedavi -- Tavsal -- ferry from Tavsal to Jaigad -- Kharviwada -- Malgund -- Ganpatipule. There are ferries from Dhabol to Dopave approximately every 45 minutes, starting at 6.30 a.m. Night services also operate. The last one leaves at 10 p.m.
From Tavsal to Jaigad, the ferry also runs approximately every 45 minutes. It goes a longer distance than the other ferries and takes around 20 minutes. Both these ferries carry cars. We departed leisurely at 10.30 a.m. and instead of heading through Dapoli on the main road (SH4), we thought we'd take a short-cut south of Murud-Karde beach. It looked promising on the GPS -- and for the first few kilometers, the road was in great condition where it ran parallel to the sea. However, it soon deteriorated into dirt, and then impenetrable pieces of rock where repairs were seemingly going on. We had to turn back. Around 10 kilometers (6.2 miles) from Dapoli, at Burondi, as the SH4 makes its way uphill, we encountered a towering statue of Bhagwan Parshuram (the sixth incarnation of Lord Vishnu). The 21 foot statue stands on a 40 foot wide globe of the earth, and was built by an optician family from Pune. It's possible to sit and mediate inside the dome. When we reached Dhabol at 12.50 p.m., the ferry was having a break for lunch and wouldn't resume operating until 1.35 p.m. It was the perfect opportunity for us to grab a quick thali lunch from one of the small restaurants on the road to the jetty, while we waited. Following the SH4 down the coast past the temple and beach town of Guhagar, Velneshwar and Hedavi villages also have appealing beaches and old temples that can be visited. The temple at Velneshwar is a Shiva one, while the temple at Hedavi is dedicated to Lakshmi and Ganesh. The idol of Lord Ganesh is particularly unusual -- it's carved out of while marble and has 10 hands. Another attraction at Hedavi is a rock blowhole, through which sea water rises up several meters during high tide. At Tavsal, we refreshed ourselves with chai, coffee, and kokum sharbat at a tranquil garden cafe opposite the jetty. By 3.30 p.m. we were on our way to Jaigad on the ferry (there's a fort that can be visited in Jaigad). And, by 4.30 p.m. we'd reached Malgund beach, just before Ganpatipule. As Ganpatipule is a famous temple town that attracts hordes of devotees to its Ganesh temple on the beach, we decided to stay at peaceful Malgund beach instead. When we subsequently saw the crowds on Ganpatipule beach, we were super happy about that decision! In fact, we appreciated our serene surroundings so much, we decided to stay two nights instead of only one. Ganpatipule is really only worth visiting for its famous Ganesh temple. The fact that the beach is crowded with devotees does not make it pleasant for swimming or relaxing. We liked the look of Tranquility Beach Resort, and its cottages under the coconut trees by the beach, as we rode past. Once again, as it was mid-week during the off-season, there were no other guests. We chose the cottage closest to the beach, which had a wonderfully unobstructed sea view. The room was basic, but spacious and clean. It normally costs 2,000 rupees per night but we only paid 1,500 rupees. Unfortunately, the property gets some bad reviews for poor service. However, as it was only the two of us staying there and we had simple needs, it wasn't an issue for us. Walking along the beach alone early in the morning, watching birds sitting on the rocks and catching crabs, was blissful. Sagar Darshan is a similar economical alternative with beachfront cottages. Otherwise, if you want luxury, try Blue Ocean Resort & Spa. Maharashtra Tourism has a well-located property in Ganpatipule. About 170 kilometers (105 miles). Ganpatipule to Tarkarli was our longest leg of the journey so far. It brought us the best and worst of times. The most spectacular scenery of the whole trip came just after Ganpatipule, as the road descended around a cliff to Aare Ware beach and then climbed back up again to provide mesmerizing views of the beach from the other side. The beach itself is deserted and unsafe for swimming though. Pleasingly, the condition of the roads was also the best we'd encountered. Yet after Ratnagiri commenced a lengthy, monotonous and uninviting inland stretch of SH4, atop hills barren with red laterite soil. Towns and food were scarce, and the motorbike started having some performance issues. According to the GPS, SH4 appeared to worryingly run into the water at Madban beach. The locals said that there wasn't a ferry to Vijayadurg, where SH4 seemed to recommence on the other side. So, we changed course and took Major District Road (MDR) 61 down through Mithgavane, crossed a number of bridges, and turned onto Rajapur Road where we rejoined SH4 in Padel. By 2 p.m., we were so hungry and fatigued. We were ready to eat anything and stopped at a nondescript roadside restaurant that claimed to serve "homely food". It was devoid of any customers, and we were served whatever had been cooked and was available. Thankfully, it turned out to be a delicious coconut-based vegetarian thali costing only 60 rupees. From Devgad, we took the more direct inland Achara-Devgad Road, which was in good condition and rejoined the meandering SH4 near Tondavali (the beach at Tondavali is beautifully isolated and worth visiting). We were relived to arrive at Malvan by 4.30 p.m. but then spent an hour with a mechanic trying to figure out the bike's problems. After much angst and deliberation, we decided to take it to the Bajaj Service Center in Kudal the next day, and stay (chill by the beach!) for three nights instead of two while it got an overhaul. (I can't say enough good things about the professional, efficient, skilled staff there). Sadly, this meant that we had to skip proceeding on to Vengurla beach though. As the very popular Maharashtra Tourism resort provides the only accommodations right on Tarkarli beach, we opted for a homestay on quieter Malvan beach. It was the weekend and our first choice, Sagar Sparsh, was already fully booked. The owner referred us to his neighbor's homestay, Morning Star, and we were so glad he did. The two properties are similar in that they both have a cottage with three independent guest rooms. However, while Sagar Sparsh is just steps from the beach, Morning Star is a bigger property with more personal space for guests. Its cottage is set further back in a coconut grove, with hammocks, chairs and tables in front. The accommodations are only a few years old, so they're attractive and modern inside. The owner is friendly, honest, and helpful. He's non-intrusive but is always around to take care of guests' needs. Rates are usually 1,500 per night, but we got an off-season discount and paid 1,300 rupees. There's plenty of hot water, and home cooked Malvani-style fish thalis for only 200 rupees. Plus, the roar of the ocean can be heard from the rooms. Paradise! Tarkarli -- Kankavali -- Rajapur -- Devrukh. After riding for over an hour along more country roads, we were thrilled to join the NH17 at Kankavali. Its double-lane, straight road made riding a breeze and greatly cut down on travel time. The bike was running like a dream too, after having had a number of parts replaced. We decided to take a short detour from the NH17 to stop at Devrukh for the night, as the accommodations along the highway aren't very appealing. Devrukh is an off-the-beaten-track destination on the top of a hill (yes, more winding roads!). It's quite a picturesque village, with the main attraction being the Devruk Museum and its works of fine art. There's also a kokum sharbat factory and the Ved Pathshala, dedicated to Vedic studies. Marleshwar Shiva temple, Karneshwar Shiva temple, and some hot water springs can be visited in the vicinity as well. The main reason why we chose to stay at Devrukh was O'Nest Homestay. This rustic oasis abounds with nature and birdsong. I was really missing the sound of the ocean after hearing it every day for a week but the soothing energy at O'Nest helped greatly. The homestay has cottages, rooms, and a fantastic tree house (with air-conditioning and western bathroom), all freshly painted and decorated in earthy colors. The tree house costs about 3,000 rupees per night, which is quite a bargain. Hammocks and swings are also interspersed through the garden. Unfortunately, our fish eating frenzy came to an abrupt end, as meat is not cooked or served there on Mondays. However, the Konkani vegetarian thali was tasty and satisfying. Devruk -- Kosumb -- Sawarde -- Chiplun -- Khed -- Mahad -- Mangaon -- Kolad. About 190 kilometers (120 miles). Although this leg was the longest distance that we covered in a day on the whole trip, it was quite easy going as we stayed on NH17 for most of it. However, after Chiplun, the highway begins its ascent and descent through the ghats (mountains), with many twists and turns. It was quite alarming to see an overturned truck on one of the bends. Wanting to prolong our time in nature as much as possible before returning to big city life, we decided to break the journey by staying at a farm in Kolad. This area is known for its farm stays, camping, and adventure sports such as white water rafting. We arrived back in Mumbai the following day, after riding for another 120 kilometers (75 miles) on the NH17. Upon taking my helmet off, I discovered my face covered in dirt from trucks on the road. Aaah, welcome home! We were jubilant that we made it without incident. The lovely owners of Kittu's Farm were kind enough to accommodate us on short notice. Their peaceful farm, located next to a sizable dam, grows mangoes, chikoo, and coconuts. It has a large family room with space for up to 20 guests, plus a couple of smaller rooms. This makes it a fantastic family getaway. The polite and efficient staff cooked delicious vegetarian and non-vegetarian food for us, made to order. Notably, the towels were soft and fluffy, the beds were comfortable, and the bathroom had quality fittings (with a rain shower!). The rate was normally 1,800 rupees per person for a 24 hour say, including all meals. However, since we were only there for dinner and breakfast, the owners generously gave us a discount.